Bridgetown, Barbados (October 23rd, 2017) – Barbados Sotheby’s International Realty recently participated in the 2017 Sotheby’s International Realty® Global Networking Event. 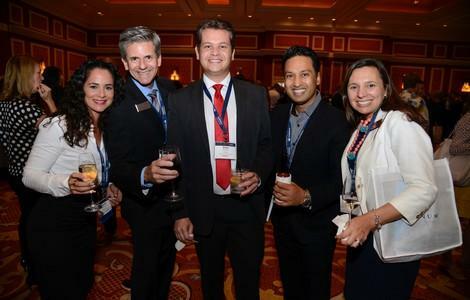 The event, which took place from September 25th to September 27th in Las Vegas, Nevada, brought together approximately 2,400 members of the Sotheby’s International Realty network, with more than 155 of the brand’s companies represented from 34 countries and territories worldwide. Held at the Wynn Las Vegas, the Sotheby’s International Realty Global Networking Event was a dynamic three-day immersion into the brand, offering two general sessions and a selection of 25 breakout sessions. More than 85 Sotheby’s International Realty affiliate members volunteered to play an integral part in the sessions, which ranged in topics from sales and negotiation tactics to marketing and more, serving as breakout hosts, guest speakers and expert panelists to share advice, best practices and personal experiences with their peers. In addition to learning and networking opportunities, this year, the Sotheby’s International Realty brand’s charitable partner, New Story attended the event. New Story, which builds communities of homes for those in need for $6,000 USD per home, challenged attendees to pledge 100 homes for a new community in Mexico. At the end of the event, attendees surpassed the goal by pledging over 150 New Story homes. Barbados Sotheby’s International Realty, which has an office in Barbados, offers exclusive Sotheby’s International Realty marketing, advertising and referral services that are designed to attract well-qualified buyers to the firm’s property listings. Exclusive property listings from Barbados Sotheby’s International Realty Sotheby’s International Realty also are marketed on the sothebysrealty.com global website, as well as on the firm’s local website, www.barbadossothebysrealty.com. As a Sotheby’s International Realty affiliate, the firm and its clients benefit from an association with the Sotheby's auction house, allowing the firm’s sales associates the opportunity for real estate referrals with auction house clientele as well as the unique ability to refer real estate clientele for appraisal services for jewelry, art, antique furniture and collectibles. The Sotheby’s International Realty network currently has approximately 21,000 affiliated independent sales associates located in over 900 offices in 68 countries and territories worldwide. Each office is independently owned and operated. Barbados Sotheby’s International Realty is located at #15 Porters, St. James, BB24017. For additional information, please contact 1.246.432.5050.